With record-breaking temperatures (an evening high of 110 degrees! 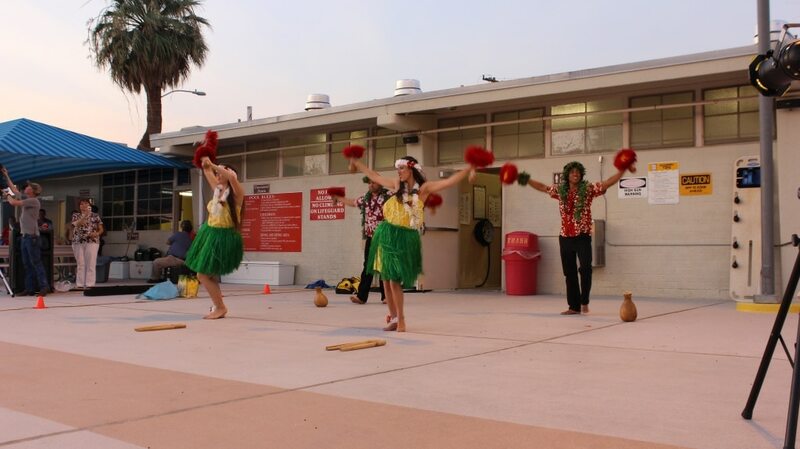 ), the good folks of the Wounded Warrior Battalion West, stationed at 29 Palms, flocked to the on-base pool, where Freedom Alliance was hosting a family luau. After receiving leis from the local troop of American Heritage Girls, most of our guests headed straight into the pool to combat the desert heat. We stocked the water with giant inflatable chairs, water guns, and other floats and toys. Meanwhile, the American Heritage Girls manned the snow-cone machines, and we welcomed a special guest, who flew in to eat with the Wounded Warriors and their families. Actor, author, and radio host Dale Dye is a retired Marine captain and a veteran of the Vietnam War. 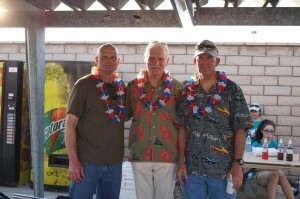 He was able to meet the residents and share stories with other Marines at the luau. Dinner was a Hawaiian-style barbeque, three kinds of meat, with delicious sides and island-inspired cupcakes for dessert. 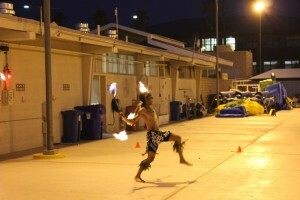 After dinner, the guests were entertained by hula and fire dancers, performing traditional Polynesian routines. Eventually everyone participated in the dancing! The kids and some of the single Marines, who are still kids at heart, lined up for the limbo contest. And the evening ended with a showing of Transformers 3 on a monster movie screen while the audience floated blissfully in the pool. 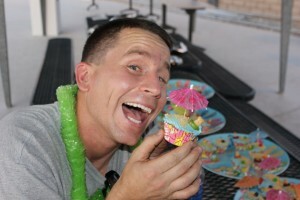 Many thanks to the battalion’s head volunteer, Tracie, also known as “The Detachment Mom,” who organized the luau. Thanks also to the 29 Palms commanding general for coming out, and all the wonderful Marines and family members who didn’t let the heat keep them from enjoying the party!